Hello, readers! I want to thank you for stopping in and checking out this blog. 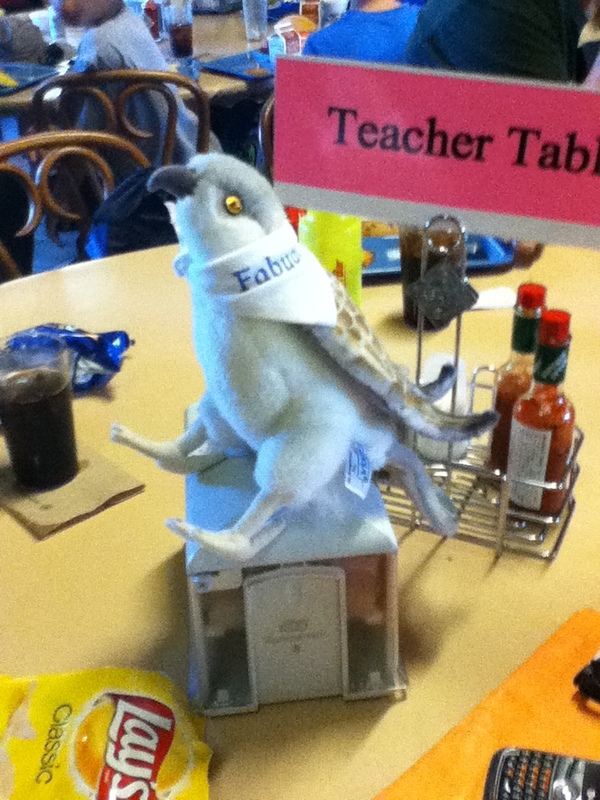 Here’s the first of many adventures for Frank the Fitness Falcon – it is all about my trip to Camp Timber Lee, Wisconsin with the 5th grade students for Outdoor Education. Hope you enjoy! 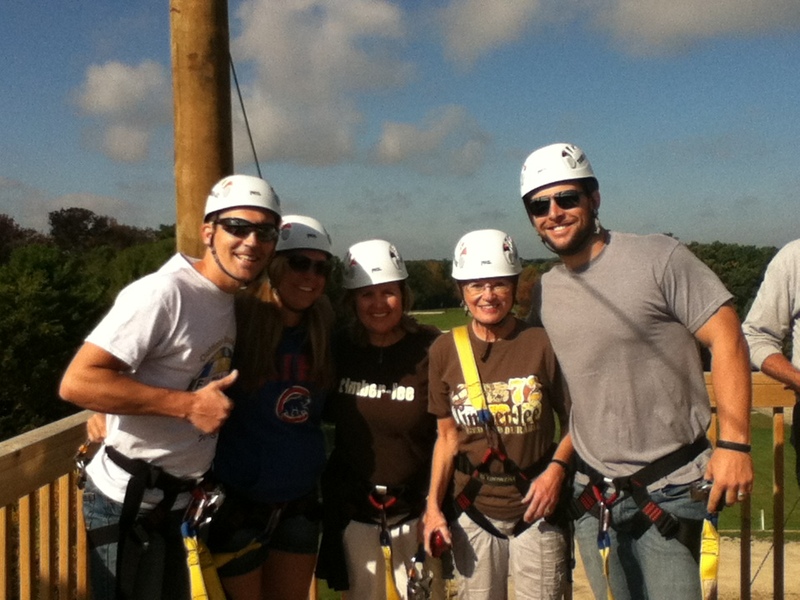 There were lots of exciting activities planned for the next few days, but the zip line was my favorite. Pictured from left to right is me (Mr. Graham), Ms. Croy, Mrs. Thompson, Mrs. Venneri and Mr. DeVries. We climbed to the top of this 52′ platform with our harnesses and helmets on. I was a little scared to jump because it was so high. Frank doesn’t have a fear of heights. 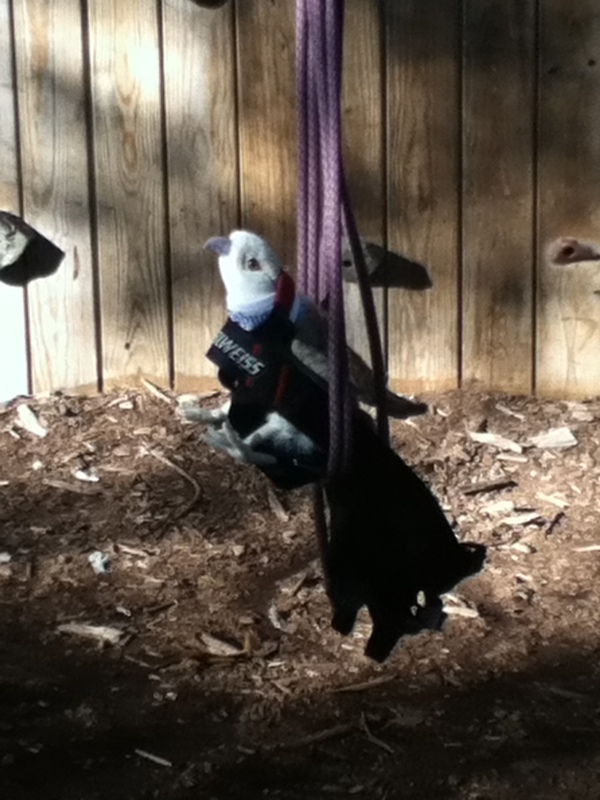 He is used to flying up in the sky so he encouraged me to do it and it was a blast! It was so fun I went down three times! I tried to get Frank to go to the archery range with me but he didn’t like the idea of kids shooting arrows while he was anywhere nearby. Then I tried to get him to go canoeing with us but he was afraid we would tip over and he is not a very good swimmer. 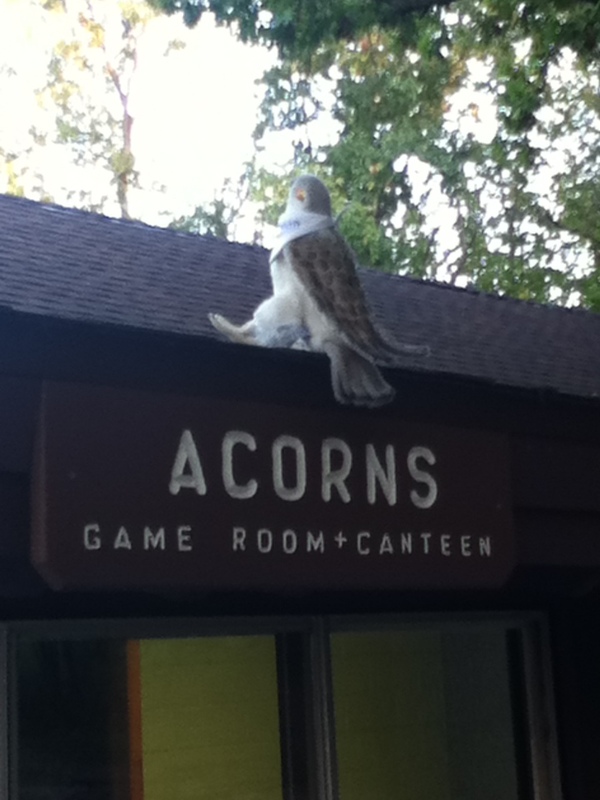 He did like to hang out at the Acorns game room. Acorns was a cool place with lots of fun stuff to do like play air hockey, foosball, ping pong and carpet ball. Here is a picture of him on top of the roof outside. He told me he liked the “bird’s eye view” from up there…whatever that means. He did manage to play a few games of ping pong. Here’s a shot of him and some 5th grade friends at the ping pong table. I learned a new game at camp called, “Ga-Ga Ball.” I have no idea why it’s called that but it was really fun to play. Players stand inside this octagon fence and you use a rubber playground ball. The object of the game is to slap the ball with an open hand and get it to hit other players in the legs. If you get hit in the leg with a ball, you are out and must exit the ring until the next game. You keep playing until there is only one person left. I guess you could compare it to a cross between 4-square and dodgeball. Here’s a picture in the center of the Ga-Ga Ball pit. He was really good at this game. I think there should of been a “no flying allowed” rule to keep things fair for the rest of us. Oh well, it was fun anyway. Of course all this playing made Frank hungry. 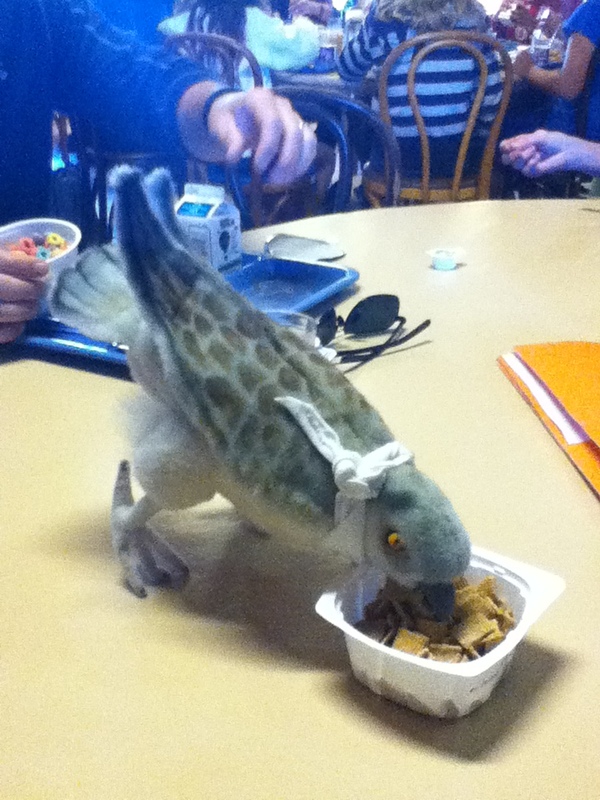 So at meal times he would come into the dining hall to eat with us. He sat at the teacher table. I managed to take a picture of him eating breakfast one morning. Yeah, those are Golden Grahams he’s eating. 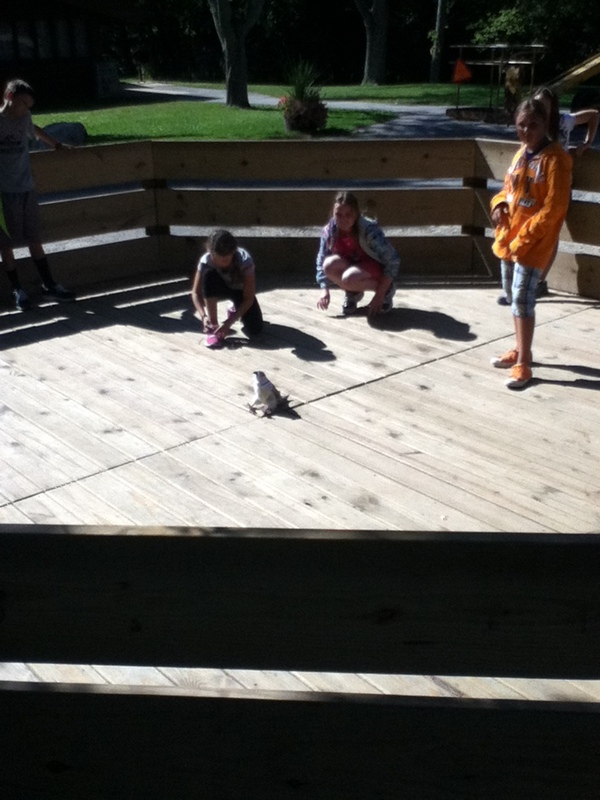 Frank liked the “Animal Encounters” activity. I think he saw some of his feathered relatives at the bird exhibit. The other birds seemed pretty jealous that he got to be outside the cage. 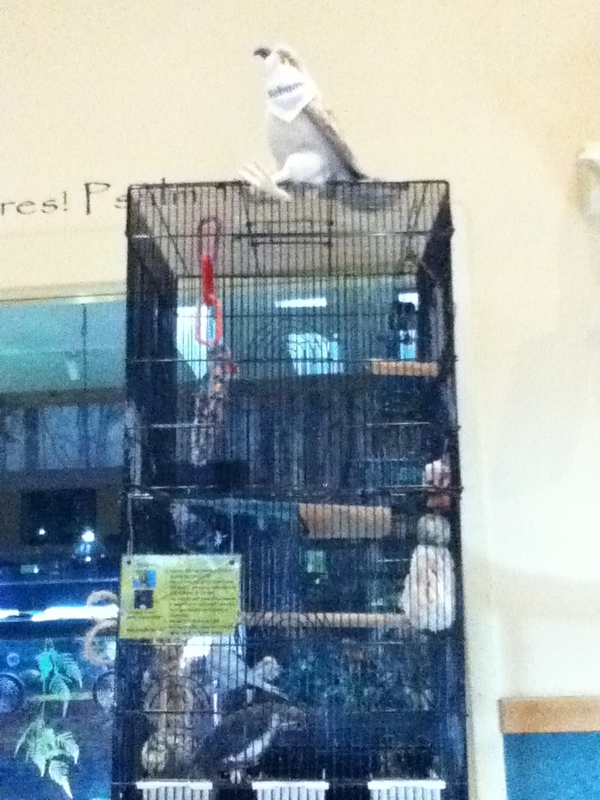 Frank was a bit of a showoff that day, calling himself the “King of the Cage.” He wouldn’t let me get away without taking a picture of him, “ruling the roost” as he called it. Another one of Frank’s favorite activities was the trail ride on horseback. 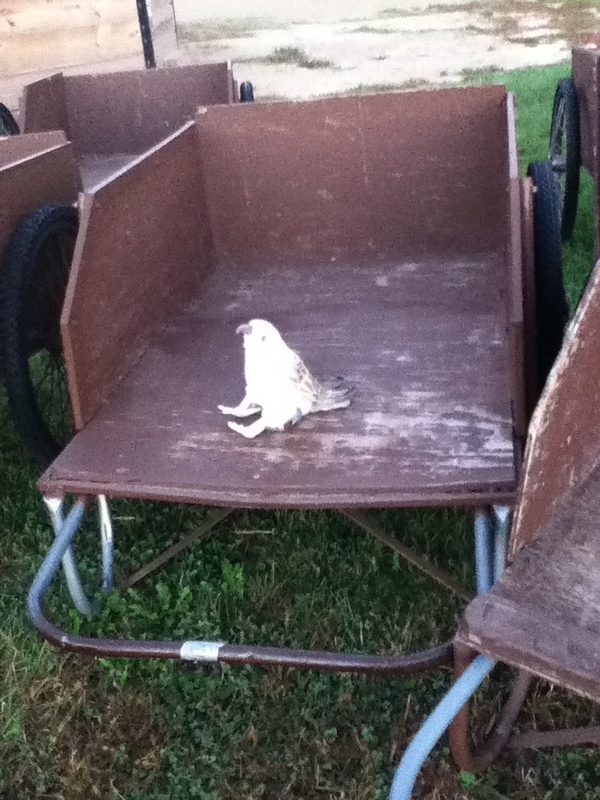 He made himself right at home up in the saddle. The horse he rode was named Bandit. 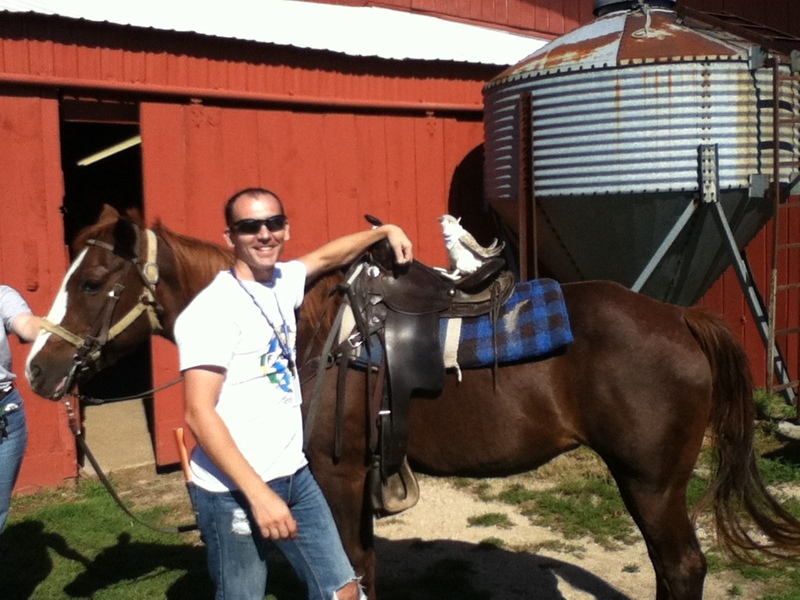 Below is a picture of me and Frank getting ready to go out for a horseback ride. We had beautiful weather and it was a lot of fun. 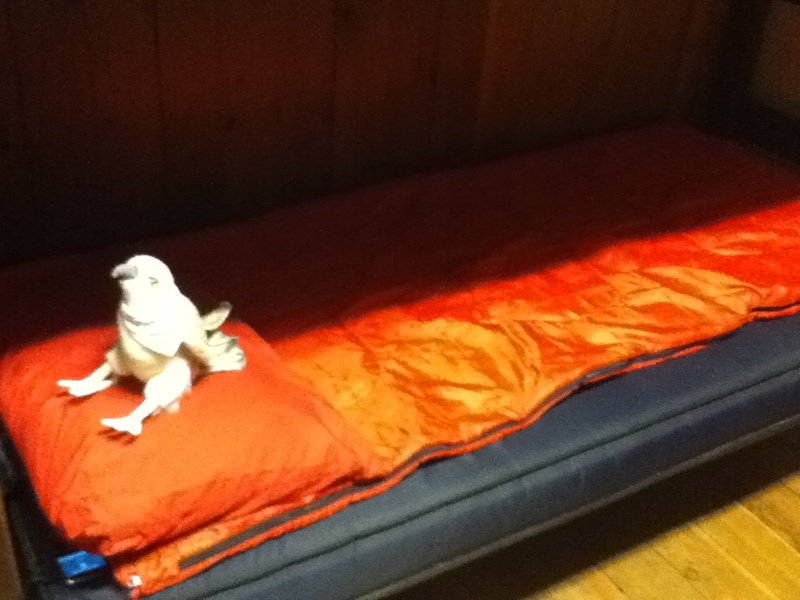 Finally, after a long day of fun activities, Frank made himself at home on one of the bunk beds. Here he is getting ready to go to sleep. He was really tired. I thought he would make a nest in the trees outside, but as you can see, he is definitely not an outdoor bird when it comes to sleeping. I’m sure Frank had peaceful dreams as he drifted off to the sounds of crickets chirping and the gentle breeze blowing through the trees outside our cabin window. I know I will always remember my trip to Camp Timber Lee for Outdoor Ed with the the 5th graders. I’m sure Frank will too. Well, that’s my story. Our adventures have come to an end. 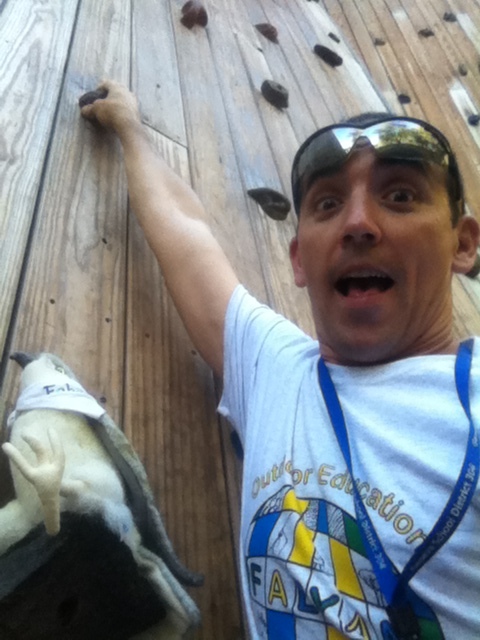 Hope you enjoyed reading about my trip to Outdoor Ed with Frank. I can’t wait to find out what kind of things you two do together!! !